Most of my "creative" friends are scared of blogs. That might seem weird, but I think it's because they wrongly assume that they're too technologically challenging to run. But somehow, like, in the last five minutes, they've all acquired myspace sites. Last week I was accosted by a woman I know in the hallway of my Nathan Barley-esque sometime offices on Lever Street. She said breezily, "Hey, what's your myspace, I'll send you an invite to the club night next month." My face fell. "I, um, I don't have one," I told her. She looked so disappointed. I felt, oddly, embarassed. Hoping to recover some sort of cred, I wrote the url for my blog on a scrap of paper. She looked at it as if it were a dirty word in a foreign language. Then I went and looked at my friends' myspace sites. The template is terrible. It's ugly and it doesn't work right, but there they all were, getting hourly updates on their favourite bands' bowel movements and frantically messaging each other to say nothing much in particular. I don't feel so bad about not being on myspace, because I like blogger a whole lot better, but I think it's cool that the music industry seems to have adopted myspace as THE way to set up a band website on the cheap. And while a lot of the blogs on these sites are feeble, vestigial things, some of them are actually really cool. So I ask you, Manchester bloggers: should myspace sites be considered blogs and listed in the Manc blogroll? What do you think? My comments box awaits your collective widsom. Uh, yeah kind of. You get loads of dodgy adverts with MySpace unfortunately. But my musicy friend Julie has a Myspace (hiholonelady)and she seems to have taken to it like er... a musician to MySpace. By the way, re: previous post about Free Wi-Fi in Manchester - there are 3 apparently: Nexus cafe on Dale Street, Fuel cafe in Withington and (bizarrely) Manchester Aquatic Centre. Keep that laptop dry! 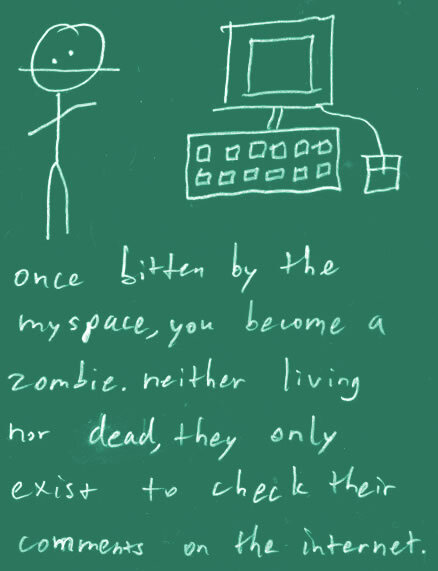 MySpace is not a blog. Definitely not. It is like asking the question does Hello magazine have any content that is could possibly be considered newsworthy? 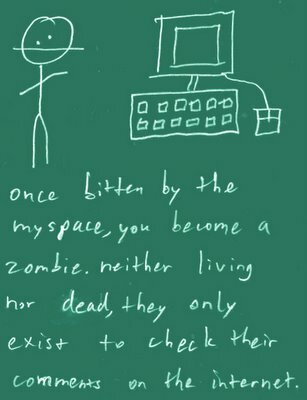 MySpace is not a blog service, they exist as a social networking website with the sole intention of well ... social networking, not blogging. In case you are interested, MySpace declared that their advertising market covers 12% of the entire online advertising. If MySpace is a blog, I'll show my arse in the window of Debenhams on Market St.
Sure, MySpace can be used as a blog - but that's not what it's designed for. MySpace is definitely used more by the musicy people, it's got to the stage now that fliers for punk nights have to state which bands *aren't* on MySpace. I've never used MySpace but if somebody is using it as a blog then why shouldn't they be listed - simply because they're using a service which isn't cool? If we're going down those lines then can I stop aggregating all the MSN Spaces blogs? And Livejournal can be borderline, though is considerably better than both. I totally agree, Lord Rich. I have no desire to be elitist about it either. I simply wanted to see what people thought about adding my space sites, since there are an awful lot of them out there in the manchester area I know of. I think what I'm getting at is that blogs should be added whatever they're hosted on, but myspace sites should not be automatically added. LordRick have a good point. :) I'm just sulking that MySpace is so "social-networking"-y and un-elitist. Kate, I have a list of Manchester bloggers who are on xanga and MSN spaces, if you are interested. Or are you just trying to create division and whip up hysteria among self righteous bloggers akin to a Daily Mail editorial? Having said that there's nothing wrong with MySpace - it's just completely different..
Hey, look ... new blogs!